These things have a bad reputation and the world is full of jokes about people dressing up as characters from their favourite show and walking around speaking Klingon etc. And yes, this does happen but to be honest it only adds to the atmosphere. There is a stereotype for people who attend Star Trek conventions that I’m sure you’ve heard a million times and I’m not going to dignify with further discussion. As with everything there are people from all walks of life who go and I’ve made some of the best, most intelligent and considerate friends at these events and had some of the most fun experiences meeting actors whose work I’ve appreciated over many years. Never in my dreams did I think when sitting watching Star Wars in 1977 that one day I’d have met Carrie Fisher, or most of the cast of the various Star Trek franchises or Game of Thrones for something more current. All these people seemed distant, inaccessible Hollywood actors but thanks to the companies that put on these events I’ve had the privilege of shaking hands with so many and being able to just say “Thank You” for the pleasure they’ve given me. And yes I know they hear it many times but it means something to me. This last weekend was the first event I’ve been to since starting this blog, Destination Star Trek 3 in London. The first event was also in London in 2012 and had the draw of having all five captains from the various Star Trek series in Europe for the first time. And you can find some photos from that event in my Picasa gallery linked to on the right. The second, smaller event was in Frankfurt, Germany early in 2014 which I did not attend. This third event was promoted on the basis of having the main Star Trek:The Next Generation cast all together, although this was spoiled somewhat when Jonathan Frakes cancelled his appearance a few weeks before. But if you like Star Trek, this promised to be the place to be. Most other events I go to are more generic. They may bias towards one show or another but will have actors from a wide range of shows and films. This one was just Trek. So with tickets in hand and after getting up extremely early to go to the Gillian Anderson book signing that same morning (see my post A Vision of Fire), I headed down to the ExCel in London getting there shortly after opening and thinking, wow, there’s not many people here. As I’d already met most of the actors who were there I only wanted 3 or 4 autographs and I was mainly using this event to get photographs with people I’d missed previously. My main autograph targets were Colm Meaney (Chief O’Brien in TNG and DS9), James Darren (Vic Fontaine in DS9), Aron Eisneberg (Nog in DS9) and Tim Russ (Tuvok in Voyager). 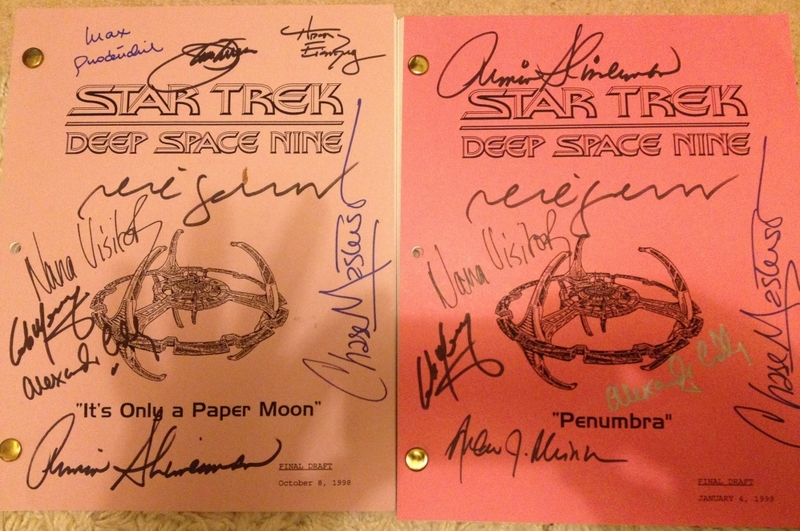 I had two Deep Space 9 scripts and a Voyager script to get signed. Normally the first task at any event if you don’t have some form of priority queuing pass is to get what are called Virtual Queue Tickets. These have a number on and the numbers are called in batches, one to keep the queues to a reasonable length and two, so you don’t have to stand in one queue for ages and can go off, do other things and join that queue after your number is called. However, this event had decided to not use this system and had introduced the requirement to buy autograph tokens as well rather than just pay with cash as you go up to the guest. So after a quick wander round to get my bearings, the next job was to find where these tokens could be obtained. The organisers had said there would be a number of places around the hall to buy them but there was only one right next to the signing area so the queue for it merged with the queues forming for the guests, making the whole thing a bit confusing initially and with no crew on hand to manage things it was left to attendees to figure it out and help each other. So I got my tokens and looked to see which guests had arrived and were signing. Not many at this point but Tim Russ was there with only a couple of other people queuing so I went and got my Voyager script signed. I mentioned to Tim that he was one of the first people I met when I started doing these events in 2003 and he remembered exactly which one it was and in fact was at the same venue. I spent the rest of the afternoon looking around and sitting in on some of the free talks. One of these was with Max Grodenchik, Aron Eisenberg and Casey Biggs. Max and Aron play father and son Ferengi in DS9 for those who don’t know and work extremely well together. Much of that relationship came through and it was very entertaining but often Aron would relate things to his favourite DS9 episode “It’s Only a Paper Moon”. If you notice above, that’s one of the scripts I have. I went to get him to sign it afterwards and he was very interested to see it, flicking through the pages to recall certain scenes and we talked a little about it’s themes. I also got James Darren to sign that one as he features heavily in it too and he was also very interested to see it. Makes a change from signing the same 10×8 photograph over and over I guess. If you hadn’t brought your own item or picture to get signed, the selection of photographs available at the show was very limited with just one or two for each guest. This aspect was much better at the previous one. And again these were only available from one place so more queuing. The show in 2012 was a partnership between two different organisers, Media 10 who run various high profile exhibitions and Showmasters who run signing events around the country. Much of how it worked in 2012 was down to the processes Showmasters employ and this works pretty well most of the time. This time however Showmasters only involvement was running the photoshoot areas and everything else was changed by Media 10. I’m not going to go into huge details but as long time attendees, both myself and my friends thought the changes were detrimental and if the show had been any busier (it was a lot quieter than the 2012 show) then the whole system would have been difficult to maintain. Around closing time I met up with my friends Bunny and Leanne. Bunny had a press pass as she is co-owner/presenter/contributor for the Visionary Trek website and podcast (well worth checking out) and there was the TNG Reunion panel, hosted by William Shatner to cover but other members of the team were up for doing that so the three of us went to the O2 for a very enjoyable meal before I eventually got home around 10:30pm. Having been up since 5:45am that was one long and tiring day and there were two more to go. Saturday morning I got up around the same time as I still had one target for an autograph, the illusive Colm Meaney. He doesn’t do many of these things and I missed his last appearance in the UK in 2012 as I was at another event. He hadn’t been there on Friday and I knew he would be popular so without the VQ system to rely on an early start and lots of queuing might be the order of the day. However I also had four photoshoots to get to so I’d only be able to queue for him at certain times. Arrived around 8:10 to find my friend Robert near the front of the queue (which wasn’t all that long surprisingly) and no-one seemed to object when I started chatting to him and just sort of stayed there. Having already bought our tokens the day before and not managing to lose them overnight, we went straight to where Colm would be to start queuing and found ourselves only a few people from the front. So far so good. But no sign of Colm. Normally the actors are ready for the show opening or shortly afterwards and if not you’d expect a sign up to say when they were expected, but not here. It got to 9:30 and there was hardly any of the guests there. We knew Colm had a talk at 10am and then a photoshoot straight after. If he then took a break for lunch it would probably be close to 1pm before he started signing. Someone asked a crew member what time he was due and after a radio chat was told 10am. We of course then said he had a talk and photoshoot. Further hurried conversations followed before they said 1pm. Great, exactly as we’d already suspected. The crew rarely seemed to know what was going on and mostly it seemed to be the attendees organising themselves that got things working. Sad when you know more about what’s going on than the crew. I had a ticket for his photoshoot and decided that once I was done with that, I’d return to the queue and hopefully not too many others would be prepared to wait that long. I got back to his line about 11:30 and there was just one other person in front of me. As it turned out he took a break during the photoshoot and came straight back to the signing area around midday and I got my scripts signed in plenty of time to go to my next shoot. My other photos that day were with the stunning Jeri Ryan in a Borg regeneration alcove set, the lovely (despite being a Spurs fan) Marina Sirtis and Karl Urban who plays ‘Bones’ McCoy in the reboot films. Great guy. Best free talk of the day was without a doubt Bruce Greenwood who plays Captain Pike in the recent films. Really entertaining and interesting to listen to. Wish I’d had the money to get his autograph and speak to him in person. Although this was apparently his first such event, at least in the UK, I hope he’s encouraged to do more. He certainly seemed to enjoy it. Got home earlier on Saturday then fell asleep during Match of the Day. But as I’d managed to get all my autographs it was just photoshoots and talks on Sunday so no need to rush as the first one wasn’t until 10am, a talk with Karl Urban. I bought tickets to just two paid talks, Karl and Jeri Ryan. Mostly because I thought Karl would be interesting being in the new films and Jeri because I’d missed her talk when she was at another event a couple of years ago. Most of the others I’d heard before and you get many of the same stories so I wasn’t keen to spend more money on those and some of the other events such as the opening ceremony and TNG Reunion panel were just too expensive for me, and from what I’ve heard weren’t all that great anyway. So I queued up for Karl’s talk and managed to get a good seat behind the VIP area but when that didn’t fill up they let us move forward so I got an even better seat and the chance to take some great photos. I thought the set up for this main “Enterprise” stage area was much better than last time. Similar hall and layout but the seats were spaced out better and were more comfortable. The lighting was more even and the sound really good, at least where I was so I had no problem hearing the answers to the questions. And for once there were some really good questions covering many aspects of his work, not just Trek but going back to some early things he’d done, the movie Dredd and his TV show Almost Human which unfortunately got cancelled after one season. He gave honest, detailed and interesting answers to all of these and was very entertaining. Excellent value and well done to the audience for coming up with a good range of questions. Then it was a photoshoot with John de Lancie who played the strange and often menacing Q in both TNG and Voyager. I’ve heard he can be an odd character sometimes but I found him very warm and engaging in the photo. I then wanted to see the free talk with Michael Dorn, LeVar Burton and John de Lancie but the seating area was already full and I’d found that if you weren’t in the central area, the sound off to the sides was rather poor plus I wanted to queue for the Jeri Ryan talk to make sure I had a good seat. I was nearer the front of the queue this time and chose a seat with a good view but just to the side as I knew I might have to make a swift exit to another photoshoot due to the two crossing over and didn’t want to disturb anyone. But when they said we could move forward again, no brainer. Got a similar seat to the Karl Urban talk with a great view of the stage and again, ended up with some fabulous photos. Jeri is stunning, really intelligent with it and certainly very honest in what she said. Her time on Voyager wasn’t the easiest and she spoke openly about the difficulties she faced joining an established show as a replacement for a well liked character who had effectively been written out. It’s easy for actors to just say they liked working with everyone and it was all wonderful but that was not the case here although it was a general view rather than picking out any specific person. She was great to listen to, had some really interesting things to say and once again there was a decent range of questions covering her work beyond Trek too. 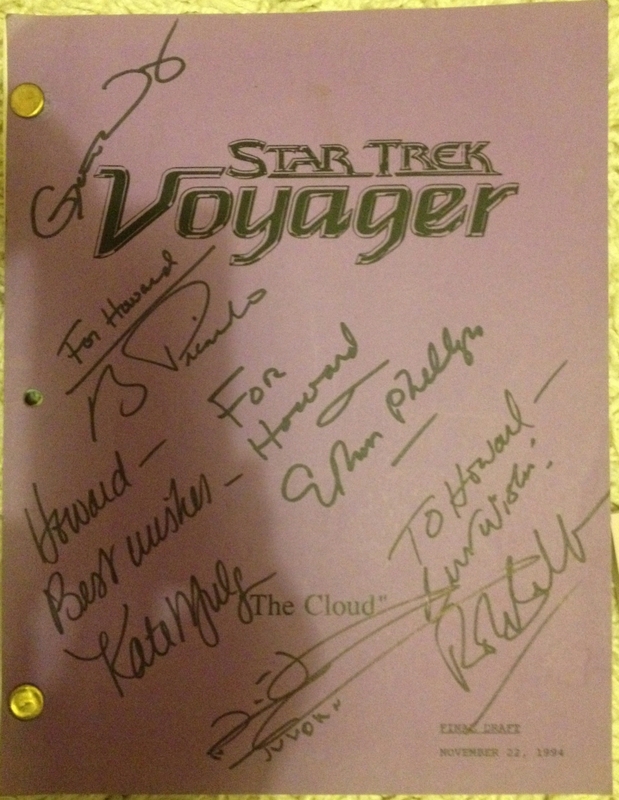 I’d originally wanted to get her to sign my Voyager script but it’s from an episode before she joined, so I thought it would be a bit weird and decided not to. I did rush away a couple of minutes before the end of the talk though to make sure I didn’t miss my next photoshoot which was with Gates McFadden who played Dr Crusher on TNG. Lovely lady with a fascinating background having done a lot of choreography for various films including Labyrinth staring David Bowie and Jennifer Connelly. After that was a talk with Marina Sirtis, Gates McFadden and Denise Crosby. This was fun but with a few too many people asking for hugs or wanting birthday wishes and things like that. At other events they will ask you not to do things like that but as I found thoughout the weekend, there wasn’t much in the way of crew enforcing or communicating any kind of rules. There were some interesting things but I felt a bit disappointed by this one even though they’re all lovely people, despite Marina being a Spurs fan and doing a little dance around the stage when someone told her Spurs were winning and Arsenal were losing in their respective games that day. Had a bit of a break then until my final photoshoot so took the time to wander around and look at the various stalls and things properly. I rarely spend any money at these events beyond what I’ve budgeted for autographs and so on but it’s always interesting to see what’s available. I didn’t think there was quite as much as last time but the variety seemed decent enough. There was an exhibition of costumes and props from the shows and movies but the perspex made it hard to take decent photos and I ended up talking to various people so that I ran out of time to really go round the whole thing. But the event was quiet enough that I was able to spend more time getting to know my friends better and meeting new people so that was good. Final shoot was with LeVar Burton who’s a great guy to chat to when you meet him and I recall having a long conversation when I met him once before. Got a nice picture and it was quick enough that I was able to get back to the free talk area where Bunny had saved me a seat and saw the final session with Max Godenchik, Aron Eisenberg and James Darren. Having heard Max and Aron before there was some repetition but James was really interesting, talking about his extensive career, playing baseball with Elvis Presley, knowing Frank Sinatra and how he was reluctant to get involved with a Sci-Fi series where he would be cast as a singer until he was convinced to read a script which he loved and never regretted the decision to take the part. And then it was over. The show was about to close and so we made our way home. There are things I missed out on such as the evening parties, including hearing James Darren perform, and things I couldn’t afford to do such as the TNG cast photoshoot on a replica of the Enterprise bridge set. Though from the results I saw I think I would have been disappointed given the expense. The lighting wasn’t right for the set and it’s very dark, making it very difficult to see some of the people in it. There was also a Skype session with Leonard Nimoy but that was exclusively for the most expensive pass holders only, not even press were allowed in. I could also complain more about the organisation but as the show was pretty quiet all weekend it was workable with some planning. If it had been really busy I think there would have been a lot of problems. But I got what I wanted from it. Saw more of the talks than I usually do which were great and got to spend more time with friends. The guests seemed in good spirits from what I could tell but I came away feeling a little flat about it all. Maybe because I didn’t do as much this time but there seemed to be no big buzz, no one that I was especially excited to see. I’m sure there will be another one. There are already rumours of one next year but not in the UK. This might be good given the large number of events there are each year now. And as we’re coming up to the 50th anniversary in 2016, maybe I could consider going to the big official one that happens in Las Vegas. Now that would be a trip. Please check out my Picasa site link on the right where lots more photos will appear once edited.